FX brokers are facing a tsunami of leverage restrictions, increased technology cost, and client acquisition cost. Consequentially, retail firms need to move their client base upstream. Leverage restrictions are coming primarily from Europe under ESMA while other growth markets like Southeast Asia and South America may one day follow suit. The lower leverage is reducing the profitability of the retail trader for many brokers depending on their business model. At the very least the restrictions incentivize brokers to target clients who stay with the firm longer and deter the “churn and burn approach” to client acquisition. The restrictions also benefit firms who deal with Professional and ECP clients as opposed to Retail clients who have the highest protection under MIFID2. To remain historical levels of profitability, OTC Brokers must create a new regulatory structure for servicing clients or become more operationally efficient by utilizing new technology. The problems with technology lie in that the entire industry is still stuck on the prolific MT4 platform which accommodates retail traders but does not meet the needs of Institutional clients, both professional and ECP. For a small to medium sized broker to adapt their MT4 environment or develop a differentiating technology that meets the needs of institutional clients requires a large and experienced team of developers who fully understand MT4 and the needs of all FX market participants. These skilled teams are usually only reserved for very large players, like Gain Capital, Saxo Bank, and FXCM. Internet Giants (or maybe better put ‘the Big Net Oligopoly’), i.e. Google, Facebook, and Twitter are all limiting or removing forex and crypto ads for most firms. There are some exceptions for highly regulated and publicly traded firms listed on top exchanges but besides the few behemoth companies exempt from the new advertising rules implemented by the Internet Giants, will make it more the vast majority of retail brokers to acquire clients. Using proprietary technology, FDC developed a solution for brokers facing these three problems. FDC Condor Back Office 2.0 is the only back office for MT4 which efficiently supports Institutional & Retail clients. Condor Back office provides brokers the ability to charge commissions, in the same way, a Tier 1 bank charges it’s client’s (in $ per mm USD) and allows firms to track rebates to their partners and salespeople easily. The system has advanced analytics and risk management tools which detect toxic trades and mitigate the risk of out-trades. Because the system connects to MT4 Manager, it is a complimentary back office which can run side by side with the brokers existing back office and all clients the broker can fully control demographic information. Condor Back Office allows firms to adapt to today’s challenges by letting a retail broker use their existing MT4 License to target and manage institutional client’s effectively. There is no system designed for this purpose and none which can better cater to institutional and retail clients. 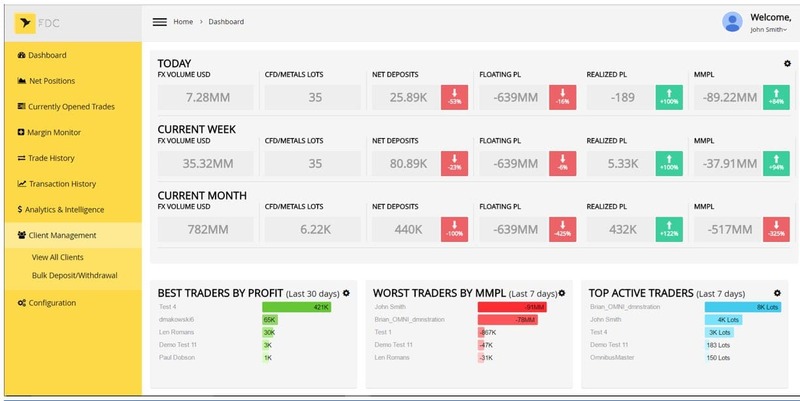 Condor Back Office for MT4 includes Broker, IB, and client portals with specific KPIs and functionality designed to allow a retail broker support institutional-grade client’s. As a unique value add, FDC provides companies R&D Accelerator. Our experienced team of programmers who understand both the tech and business side of things can supplement a brokers existing technology team to ensure they meet their technology goals. In addition to Crypto and Client-Driven development initiatives, the FDC in-house development team is hard at work adding CRM, Client Onboarding, and Multi-Platform (MT4, MT5, Flex Trade, etc.) to Condor Back Office 3.0. If you are a retail firm looking to pivot to the institutional market you need the best technology to be successful. Why try to plug a square peg into a round hole when all you need to do is license the Condor Back Office for MT4.